If you're setting up an automated messaging campaign for your clients and wondering which time-slot would be ideal to set as the message-delivery time, this article will guide you through all the parameters that you need to consider to maximise client engagement. As you can make out from the above diagram, wait-time is a time-window for which the message waits before its sent, while the delivery-time is the exact time at which the message is sent. 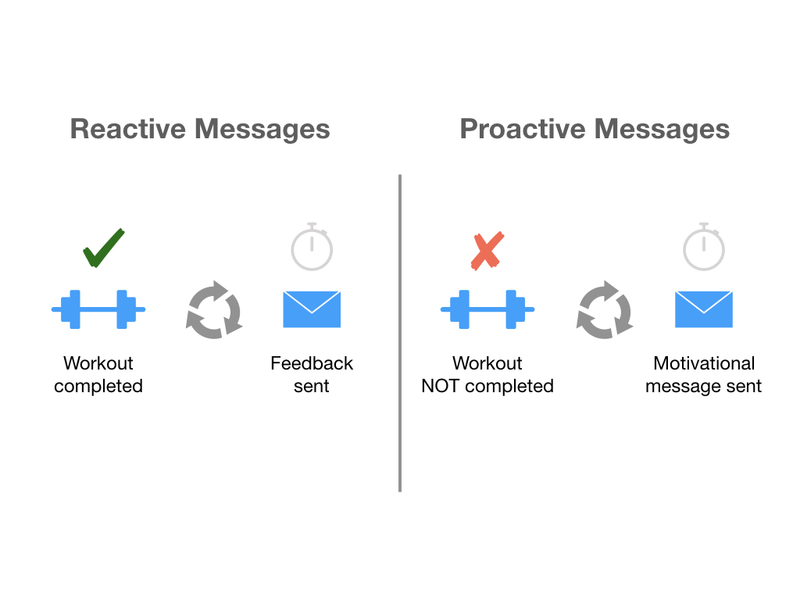 Reactive v/s Proactive messages: The first parameter that you need to consider for message delivery is the type of message you're sending － whether it's reactive or proactive? Reactive messages include feedback on workout activity and they should ideally be sent immediately after a client completes an activity (for instance － a workout). Proactive messages are reminders or motivational messages that you send to your clients to increase awareness, engagement or conversion (for instance － inactivity nudges). Depending on whether you want to send reactive or proactive messages, you need to set a delivery time. While it's not a strict guideline to follow, but as a rule of thumb, we recommend NOT setting a delivery time for reactive messages. If you set a delivery time to 9:00 AM for a trigger "after 2nd workout", because your online bootcamp clients normally complete their workout by 8:30 AM everyday, there's a possibility that your message would get sent one day late, in case one of your clients complete their workout late. That's because the delivery time is evaluated after a conditional trigger is fired (refer the above diagram). Therefore, it's always best not to set a delivery time for reactive messages. 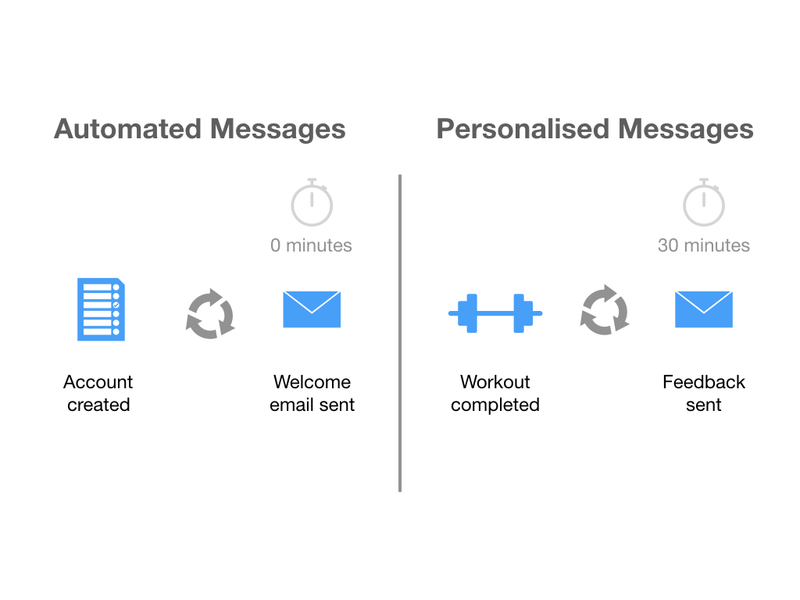 For proactive messages, like fitness advice or inactivity nudges, wait-time doesn't make any sense, and we recommend only setting a delivery time for the message. ideally, the delivery time for such messages should be configured in the high-availability time-window. For instance, you can configure an inactivity nudge message to be sent after work-hours or during weekends, so that your clients get enough time to react to it. - Reactive messages: No need to set the delivery-time. Only configure the wait time. - Proactive messages: No need to set the wait time. Only configure the delivery time. 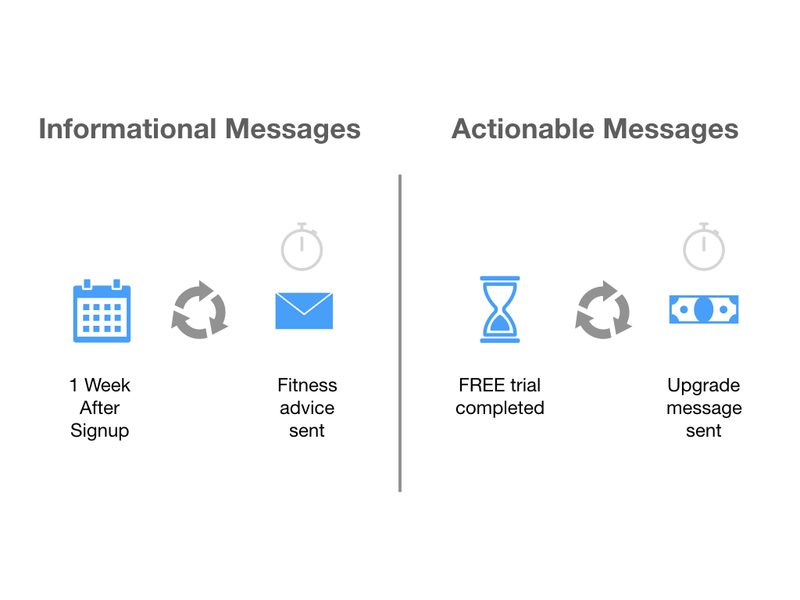 Informational v/s Actionable messages: When you're configuring an automated messaging campaign with proactive messaging (like, fitness advice, upgrade prompts or inactivity nudges), you might need to set a delivery time, considering the final call-to-action of your message. For example, if you're providing fitness advice (informational messages), you can set the delivery time to be in the morning, as that allows clients to take corrective action and plan their workout or meal plans better. However, in case you're looking to send upgrade or inactivity-based messages (actionable messages), you should schedule it in the evening, when they have time to act on it. - Informational messages: Delivery time set to early part of the day, so that they can plan the next steps better. - Actionable messages: Delivery time set to later part of the day, so that they have time to take the action immediately after reading the message. For automated messages, you don't need to set a wait-time or delivery time, so that they are sent immediately after the trigger condition is met. However, you might want to set a wait-time for personalised messages to simulate the feel that it wasn't sent automatically. You might also want to send those messages at a strategic time to maximise the probability of your clients reading the message and reacting to it. - Automated messages: Zero wait-time. No delivery time. - Personalised messages: 30 mins - 2 hour wait time. Delivery time can be adjusted based on the factors mentioned above. Frequent v/s infrequent messages: Apart from the message's delivery time, frequency also has a direct impact on client engagement. You don't want to be sending messages less frequently, as that would give the perception that you don't care about them. However, messaging them too often (for instance, after every workout) might seem too desperate, and you'll have a hard time converting those clients. 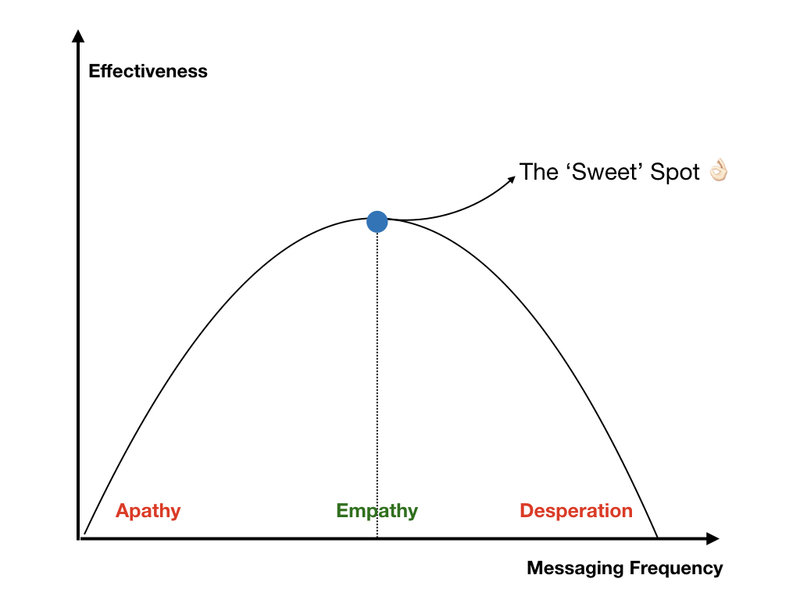 The ideal strategy we recommend for messaging frequency is somewhere between the apathy and desperation zone. We like to call this zone the empathetic sweet spot. - Set your message frequency to be in the empathetic zone -- not too frequently, not too less. - Outline different training touch-points based on their plan and deliver value with every message that you send. No time-zone configuration required: You don't need to optimise the messages based on the client's time-zone, as TrainerFu handles that time-translation implicitly. For instance, if you're in US time zone, and offering online training to a client in Australia, you don't have to optimise the delivery time, based on the time-deviation. If you want the client to receive a message at 8:00 A.M, just set the time as 8:00 A.M, and our software will handle the rest for you.